It was perhaps the largest youth movement in human history. In 1968, China’s Communist leader Mao Zedong sent more than 17 million junior high and high school students “up to the mountain, down to the village” to learn from the peasants. His goal was to build the perfect socialist society. Many “sent-down” youth participated eagerly, driven by revolutionary zeal and devotion to Chairman Mao. Others, saddled with “bad” family backgrounds (offspring of “rightists,” “reactionaries,” “intellectuals” and other “class enemies”) were forced to go. Many remained in the villages for a decade or more. The documentary Up to the Mountain, Down to the Village returns with three members of China’s “sent-down” generation — now U.S. citizens — to the remote villages where Mao sent them three decades ago. They recount the loneliness, despair, and physical hardship they endured as teenagers in unfamiliar surroundings, separated from their families for the first time. They also bring along their American-born children, exposing them to the harsh realities of life for China’s peasants. 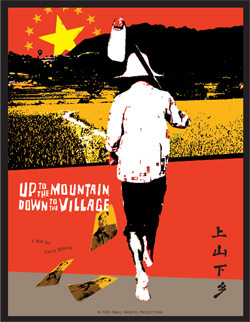 Up to the Mountain, Down to the Village blends never-before-seen archival material with new footage of the lush rice paddies, hardscrabble peasants and cramped living conditions of rural China today. It captures the return of the three former “sent-down” youth to the ramshackle huts where they lived, and their reunions with peasants they labored with in the fields during that turbulent time. Three decades later, members of China’s “sent-down” generation remain profoundly influenced by the years they spent living in the villages. Most had no experience in agriculture, and were unprepared for the taxing physical labor that was required of them. In addition, peasants often greeted them with hostility, viewing them as simply more mouths to feed. For many “sent-down” youth, it was their first exposure to the wrenching hunger and dire poverty that were the lot of tens of millions of Chinese peasants during the Mao era.